So…I have a project I’m developing that requires Bluetooth. Basically, it’s an app to control some hardware I built. 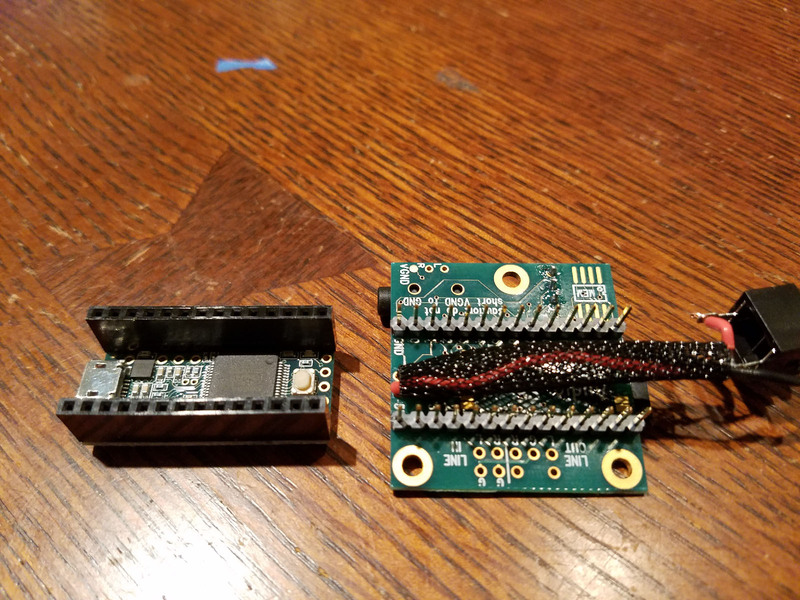 I had an old HC-06 Bluetooth module lying around and it worked great. Was easy to get setup and connected to my Teensy microcontroller…but it only worked with Android. My iOS devices could not even see it. I later found out is was working on Bluetooth 2.0 and NOT the required 4.0 (BLE – Bluetooth Low Energy) required by iOS. First of all, why do you need a BLE with iOS? Because they want a cut of the Bluetooth market and have specific requirements that are NOT part of the standard Bluetooth spec (what? Apple is doing their own thing? Say it ain’t so!!!!) However, BLE seems to get around this requirement. Ok, no big deal. 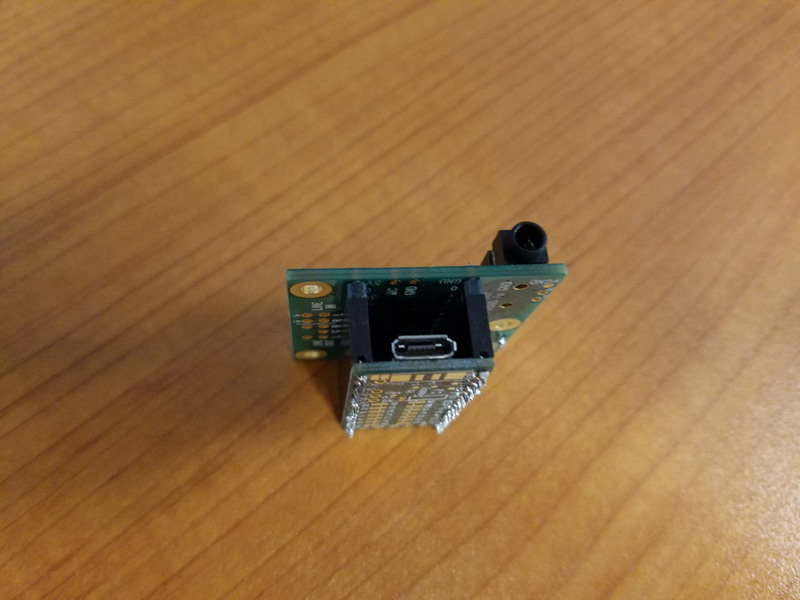 I found a device advertised as an HM-10 BLE module for Arduino that would connect to Android and iOS. Great! And it was inexpensive. Even better! It arrived after a few days and I was excited to hook it up and start testing my app on iOS. My iPad Mini could not see it. What? My Android could see it, but could not connect to it. Double what?? A help screen came back…and a lot of AT commands were not listed. At the bottom was “bolutek.com.” Crap. However, when I hooked it up…SAME THING! Android could see but not connect, iOS could not even see it! WTH?! 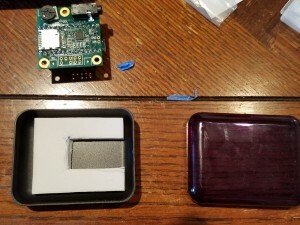 After some digging around, I learned that BLE works differently from Bluetooth 2.0. First of all, no contracts. That means I don’t have to pair it to a device ahead of time. It’s all done “on-the-fly” so to speak. I fired up my app and had it scan for BLE devices. Voila! It was there! On both iOS and Android. Lesson learned. 1. Second oscillator missing. This is a dead give away. The image below shows two metallic rectangles above the black chip. Those are the oscillators. You’ll notice in the other two boards, the second one is missing. 2. Large chip on the board should say CC2541 or CC2540 (I know, this can be faked as well, but so far have not had that experience.) 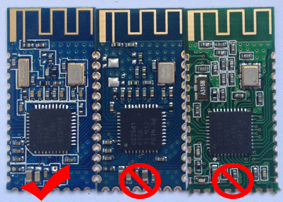 Even if the chip DOES say CC2541 or CC2540, if the other oscillator is missing…it’s a clone. 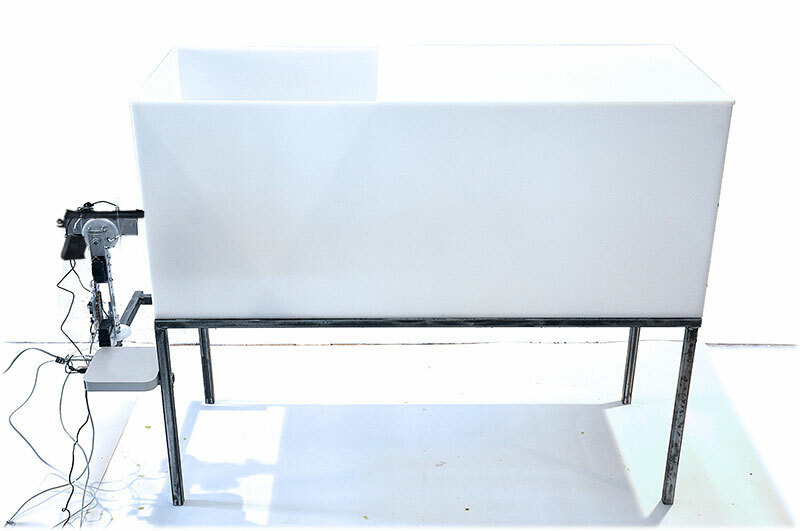 So, if you ever find yourself in need of something like this…beware. ALL of them are advertised as HM-10 with the CC2541/CC2540 chipsets. So far both have worked fine for me. If I ever have a more complicated project, I may stick with the HM10 as it has more capabilities. 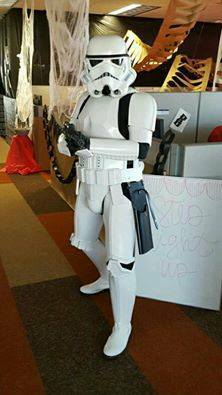 I have been working on my Stormtrooper armor (also known as a TK) for quite a while now and FINALLY got it finished in time for Halloween. Why build Stormtrooper armor? Is that even a question? Do you event KNOW me?!!?! Ultimately, I will be joining the 501st, a charitable organization….”Bad guys doing good.” Check them out. Meanwhile, Halloween was a blast (pun intended)! Walking around the neighborhood, I can see why everyone tells me how fulfilling it will be to be in the 501st and bringing joy and smile to kids and adults alike. Lots of photos were taken….lots of smiles on kids’ faces. It was a blast. 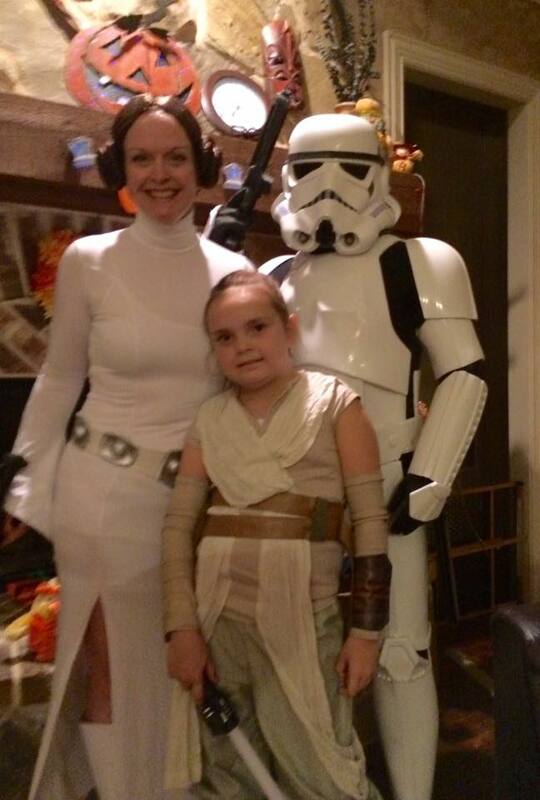 Plus I was with Princess Leia and Rey..so…SCORE. It also was a great way to road test the TK Talkie system I designed. 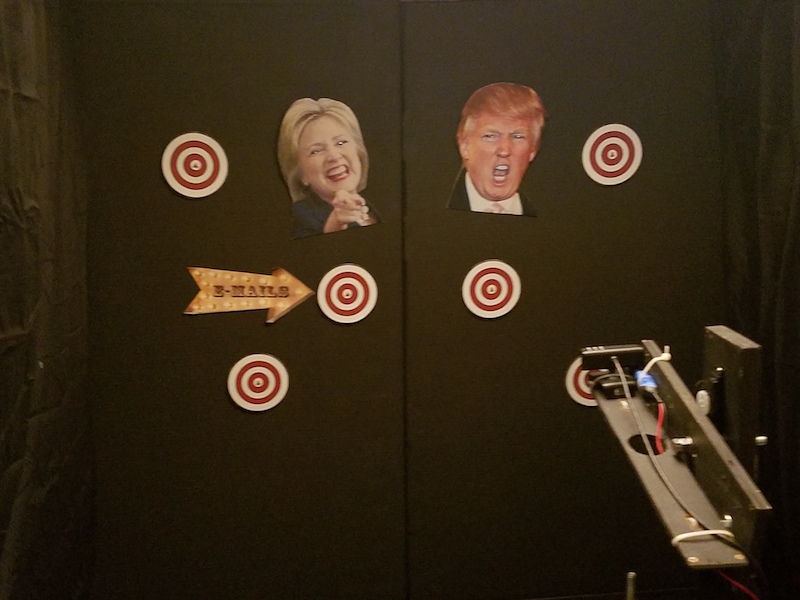 It’s a cool vocal effects board that makes your voice sound like it’s coming over a radio and adds the obligatory sound effects when you stop talking (clicks and static bursts and such.) It’s an open source project and highly customizable. It worked wonderfully and really adds to the character of the costume. This tutorial is for Version 1 of this project. There is now a Version 2 available. In order to build Version 2, follow the tutorial below, and the alternate steps for Version 2 are marked below. 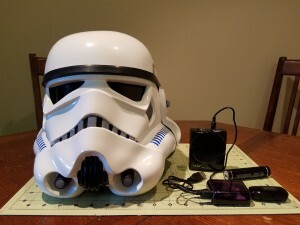 I’ve had a blast building my kit and helping and being helped in the process by so many great people that are so ready to offer up their knowledge via the Anovos Facebook group and of course WhiteArmor.net. 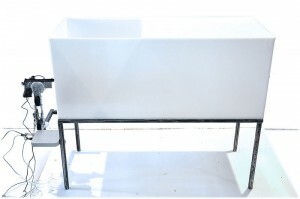 Did I mention it is FULLY customizable? Since you have the source code you can do pretty much whatever you want with it! You can get the source code and instructions from my Github repository. Ok, enough chatter (see what I did there?) Let’s get to it! 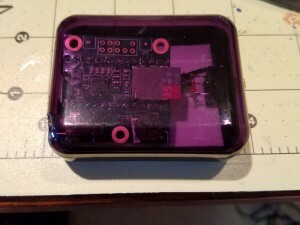 I built my effects box using a Teensy 3.2 and Teensy Audio Shield, although you can actually use other boards if you want. 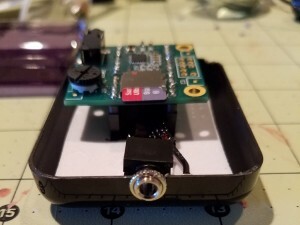 Teensy is pretty powerful and just makes it easy! If you are building Version 2, you’ll need to get the pre-pinned Teensy, or else solder your pin headers the same as the pre-pinned Teensy. YOU WILL NOT NEED THE SOCKET SET OR THE HEADER PIN SET LISTED BELOW. Speaker…the most commonly used is the Aker 10W. I got mine off ebay $34.99 (http://www.ebay.com/itm/180915641842?_trksid=p2060353.m2749.l2649&ssPageName=STRK%3AMEBIDX%3AIT) You can usually find these cheaper so shop around. NOTICE: The link to the Arduino software below is the general downloads page…the current version of the TeensyDuino software DOES NOT work with the latest version of Arduino (1.6.9 as of this writing) so you’ll need to grab an older version. 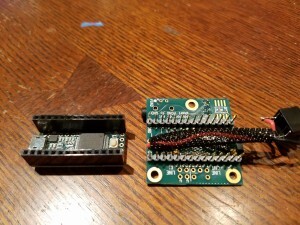 Once you have your Teensy and Audio Shield in hand, you’ll need to install the Arduino software as well as the Teensy software, called TeensyDuino. Take some time and familiarize yourself with the examples and tutorials under File > Examples > Audio and File > Examples > Audio > Tutorial. There is a lot of great stuff there. Additionally, watch the Teensy Audio Tutorial and Workshop video on Youtube to get an idea of what you can do with this awesome piece of tech! If you did not get the pre-pinned Teensy, then you’ll need to solder the header pins on the Teensy. Then solder the sockets on the Audio Shield. 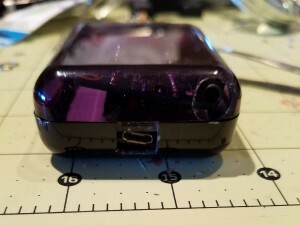 Put the short end of the header pins on the “top” of the Teensy…that is, the side that has the micro USB connector and the programming button. The long part of the pins should point up and away from the side with the usb connector and button. On the Audio Shield, solder the short end of the socket pins to the underside…or the side that has the SD card reader and headphones jack. The long end of the sockets should be on the opposite side. It’s important to get these right so that the connections are correct when you put these together! If everything is lined up, the micro USB of the Teensy and the headphone jack of the Audio Shield should be facing the same direction. The SD card reader expects the files to be in old-school 8.3 format and all UPPERCASE. That is, the file name can have up to 8 characters and the extension has 3. The way the software is CURRENTLY written (remember, you can change it however you want) it looks for a file named STARTUP.WAV when it first boots up and plays that, then reads all files that start with “TKT_” and loads them into a list that it will randomly select from each time an effect is played. Try to keep all your WAV files at the same volume level. If they are not, you’ll have weirdness where some effects are louder than others. There are lots of free WAV file editors out there that will let you add or remove gain from your WAV files. If you have downloaded the zip file, go ahead and unzip and load these files onto your micro SD card and then insert into into the SD card reader on the audio shield. In the Arduino software, go to Tools > Board and make sure to select the correct board (in this case, Teensy 3.2/3.1). I used the BitCrusher component to compress the voice and lower the pitch just a tad so it sounds like a crappy old walkie talkie. The software sketch is commented pretty heavily so that you know what’s going on. Feel free to play around with it and tweak to your liking! Again, take a look at the READ.me file on the Github repo. Panel mount 1/8″ stereo input jack soldered to Audio Shield. Note the jumper between the left and right input channels on the jack since the microphone input on the Audio Shield is mono. You can either use the microphone input on the audio shield or the line-in. It’s easier to use the microphone (IMO), but feel free to use the line-in if you want (that just means you’ll need to use some type of powered input signal.) 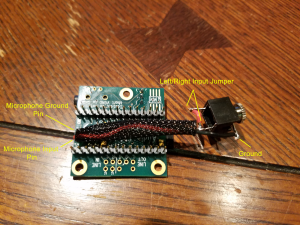 The microphone is mono with a single positive lead and a ground, and I used a stereo input jack, so I just jumped a wire between the left and right pins on the jack and then soldered the microphone to the board. Make sure you solder the ground on the input jack to the ground on the audio shield. Once this is done, you have a “complete” system. You should be able to connect everything back up, including connecting a microphone, fire up the board (you can use the 5V power supply at this point or just keep using your computer’s USB port,) hear the STARTUP.WAV file, then start talking and hearing voice effects! As luck would have it, I had recently upgraded my phone to a Galaxy S7 and as it turns out the plastic box that the headphones come it is almost perfect for the job! The boards can squeeze in there and be held pretty safely in place! Yay! 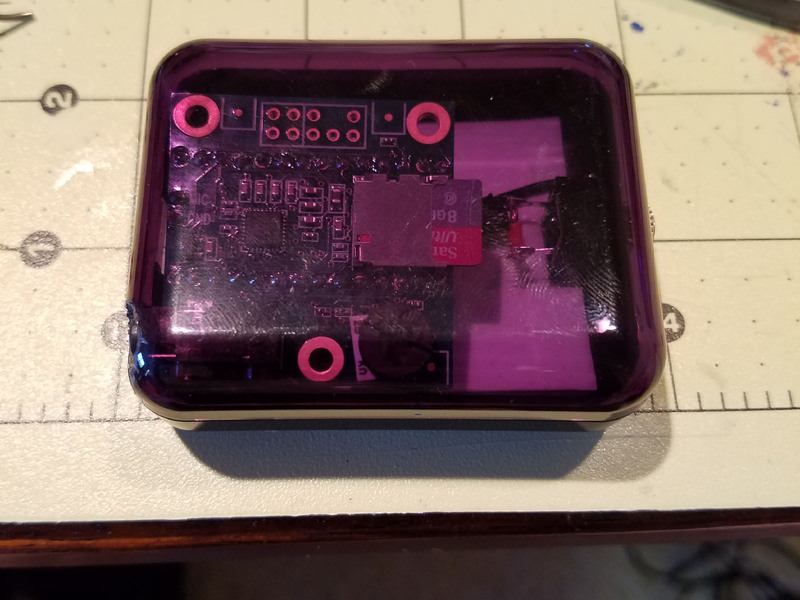 In order to prevent the board from rattling around inside the box once it was closed, I took the sticky foam pads from inside the TK helmet (if you’ve done any helmet upgrades you know what I’m talking about 😉 ) and cut out a rectangle shape and stuck it to the bottom of the case. Trimmed down sticky pad from inside the TK helmet. The only bad thing about the case is that it curved on the sides, so in order to get the board to sit flush I would have to make openings a little larger in order to get to the connections. Not a big deal, I need this to work, not look pretty (although…to be honest…I would like it to look SOMEWHAT pretty) since it will be mounted behind my chest plate. 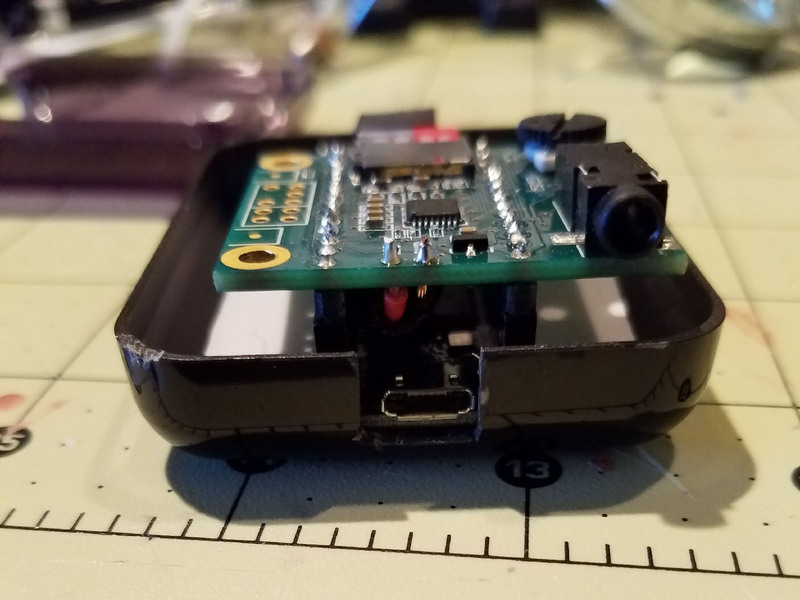 Next, I test fitted the boards and marked where I would have to make openings for the micro USB, headphone and microphone jack connections. Since this case has a top and a bottom, I would have to make cuts in both. After test fitting and marking where to cut, I got out the trusty Dremel with a cutting wheel and some needle files (if you don’t have needle files….bro? Do you even cosplay?) Also an X-acto knife comes in handy for some finer trimming. I cut the opening for the micro USB first since it was on the bottom and I needed to make sure it went low enough so that when the boards are resting on the bottom of the case I could plug in the micro USB cable. 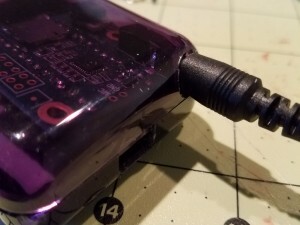 Cutting the opening for the micro USB connection. 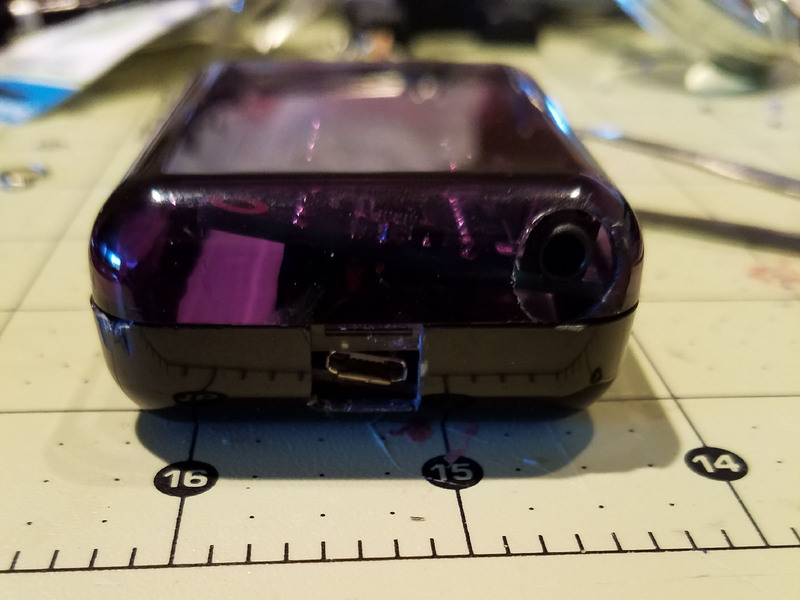 Next, I marked where the headphone jack would need to be accessible through the top part of the case and started by drilling a 1/16″ pilot hole, then eventually ended up using a 1/4″ drill bit and widening the opening to make sure the speaker connector could be plugged in. Each time I cut an opening, I used the needle files to smooth it out and the x-acto knife for fine trimming as the plastic was soft enough that it started to melt from the Dremel or drill if I went too fast. At first the opening was too small, so I had to go back with a larger bit to open it up more and then use the files to smooth it out so the entire connector would fit. 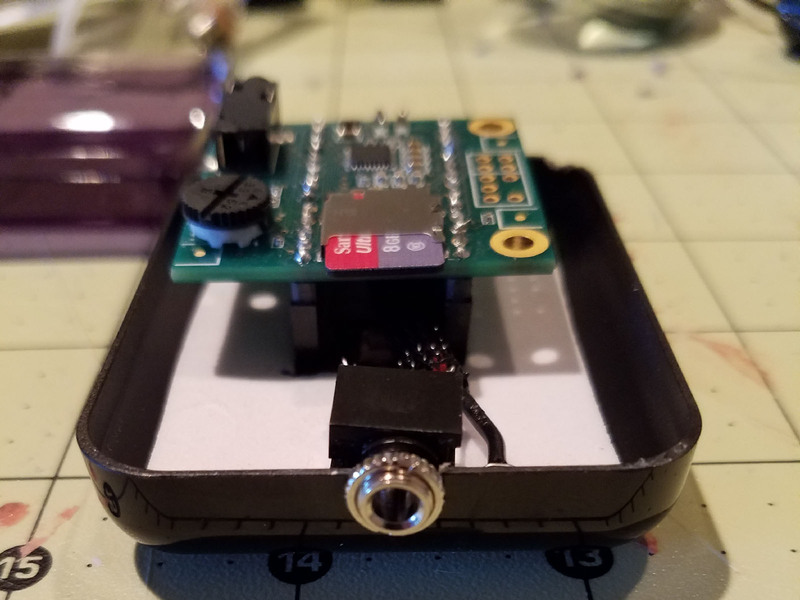 Also, once I had the openings for the micro USB and headphones cut out, I put the boards in the box and closed it up for another test fit and noticed that I didn’t actually have the clearance I though I had so the board kind of sat lop-sided. Oops! Oh well, like I said, this needs to work more than it needs to look pretty, plus it ended up holding the board pretty securely in place! Oops! Turns out the box was not as tall as I thought! I could still access the connections, though…so all good. I chose a panel mount microphone jack because I knew that whatever I ended up using for an enclosure, I would want it accessible from the outside (as is normal.) However, with this one, I would need to make cuts in both the bottom and top of the case in order to get it to fit. Had to make an opening in the bottom of the case and then cut a notch out of the lid for the microphone jack. Once I was done with the openings for the connections, I was able to close up the case, hook everything up and voila! It works great! 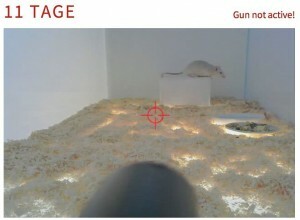 11 Days – Shooting a Rat on the Interwebs! Last year I was contacted by an artist from Germany regarding the web-controlled paintball gun that I had built. He said he wanted to use it in an art project he was planning and wanted to know if I would be willing to help him build his own paintball turret that could be controlled via the internet. Since my original intent for building the paintball gun was to allow people to control it over the internet (but, alas…life and all that got in the way) I was excited to have the opportunity not only to provide assistance, but to finally see that vision realized. I mean, how cool is it to be able to control something like that over the internet…but how much cooler to control it when it’s half-way around the world! After several months of e-mails back and forth, we started in earnest around December of 2014. I sketched out the basics of the design and gave him a hardware list. He had constructed his own base for the turret which I thought was a very elegant and simple design. I sent him wiring schematics and in short order he had a working paintball turret. The next thing was for me to update the software that would be needed to control the gun. I had written several versions of the software previously, including one that allows people to vote via hashtag on Twitter and have the paintball gun shoot some pre-programmed target based on the the tally, but I needed to make sure it would be robust enough to handle a LOT of traffic PLUS I had to add a queuing system and some other features. I won’t go into all he boring details here (I’m more than happy to do that if you want to contact me to discuss the project, however…) so here is a summary of what was used and how it was setup. Local installation of FFMPEG on a computer with a webcam connected – This was used for live video streaming. FFMPEG notes itself as being the “Swiss Army Knife” of video tools…and it’s true! Local installation of Node JS on the same computer – this system was basically a pass-through from the web layer (explained later)…in other words, it had a minimal configuration that told it about the servos (min/max angles, etc.) and was responsible for communicating with the Arduino to control the servos for the paintball gun. Remote installation of Node as a streaming server – the local video stream connected to the remote streaming server for video distribution. 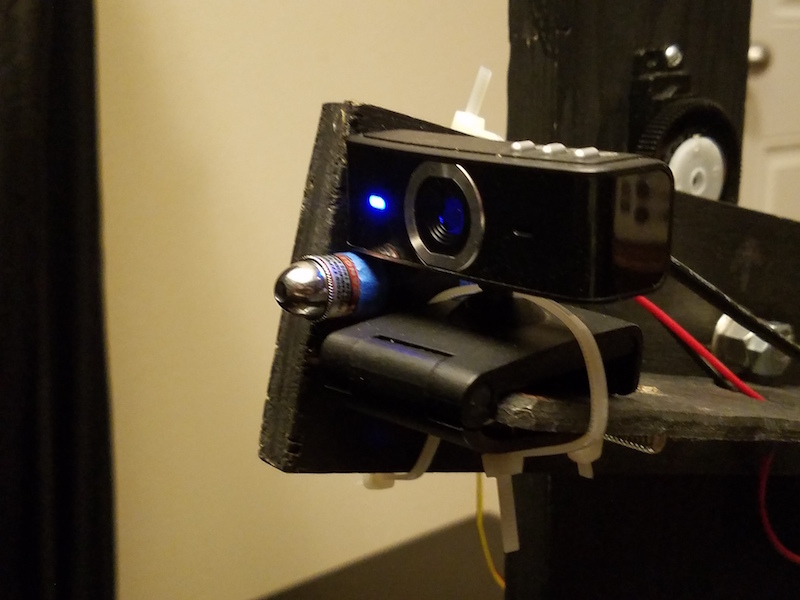 Remote installation of Node as web server and socket server that would interpret client movement in the browser and translate coordinates appropriately and send them to the local Node server to control the paintball gun. This type of setup gives maximum flexibility and allows for variations in implementation…in other words, the “middleware”, so to speak, at the web server layer is responsible for making sure that the translated user movements fit within the limitations of the local configuration. If you want to change the experience…say, the way the user can move the paintball gun, for example…you could do that by changing just the middleware layer and leave all of the other stuff alone. A configuration file (in JSON format) defining servos, min/max/home angles and communication settings is loaded by the local Node installation. The local Node instance then connects to the remote instance (defined in the config file) and sends these same settings. Users connect to the remote Node server, which acts as both web server and socket server. The size of the video display area is sent to the web server which then calculates a movement ratio based on the settings received from the local Node instance. This way, the user’s movements on screen are more accurately translated into the paintball turret’s movements. The video server was a very simple setup: FFMPEG running on the local computer connecting to a remote streaming server (also Node JS.) When a user connects to the website, a video streaming socket is also opened so that they can watch as other people move the turret around. The artist, Florian Mehnert, had caused some controversy with his previous art projects (just Google Florian Mehnert) and this project was not going to disappoint. As a sort of protest against the use of drone strikes, he was going to allow people from all over the world to control a gun (no one knew is was a paintball gun at the time) and be able to shoot a rat at the end of an 11 day countdown. If you visit the site now, you’ll see the true intent and message of the project. I had planned on posting all of the code to GitHub, but have not had the time to get it prepared for public use. However, if you think you would like to experiment with the code in your own, project, just drop me a line.